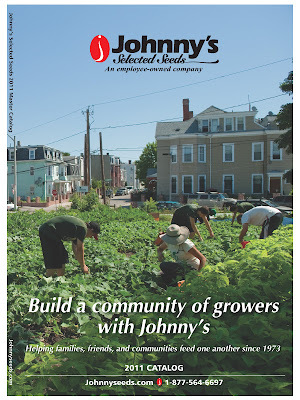 Growing Ideas with Johnny's Selected Seeds: Coming soon: Johnny's 2011 catalog with 200 new products! Polar Bear pumpkin, an extra large white pumpkin growing from 30-65 lb., and holding its bright white color longer than other varieties that fade to orange or green. Salt and Pepper cucumber: a white-skinned Johnny's-bred pickling cucumber with powdery mildew resistance, available in organic seed. Cheyenne pepper: a sweet and spicy cayenne type for fresh use. Cabernet Red Onion: a large intermediate-day red onion, early to harvest, with good storage capability. Adam Gherkin cucumber: a good producer of smooth gherkin-type cucumbers for pickling, available in organic seed. Massada tomato: a greenhouse beefsteak tomato with great flavor and texture. Corvair spinach: a medium-green smooth-leaf spinach ideal for spring planting, available in organic seed. We also have 35 new tools and supplies, including some really cool ones, like the Jang Clean Seeder and the Quick Hoops™ High Tunnel Bender. If you'd like to get an early start on planning and shopping for the next growing season, all the new products are available now to purchase on the website. We will also have a digital version of the catalog on the website, probably in early December. We call it the "virtual catalog". Other than being paper-free, it's identical to the printed edition with a few extras. With the virtual catalog open on your computer screen, you can view extra photos of all products and zoom in on the text and images. You can also place your order with the click of a mouse. The new varieties look awesome! Looking forward to seeing the new catalog.